Friday night you said, "I know I'm different. But why?" to me. I couldn't answer you with anything but a nonanswer because you caught me off guard. 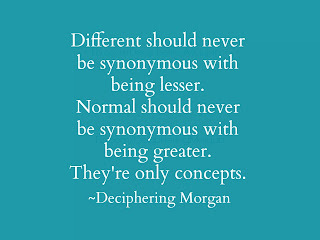 I know I told you that "different" is how you are made and that's terrific, but that's not what you were asking, was it? I know that you weren't needing your mom to break down and have a brief ugly cry and I'm so sorry for that. I wasn't crying for you being different, son. I was crying, in part, because you realize that you are different and my fear being realized that you might not want that "differentness." I don't know exactly why you're different. Why you're autistic. No one knows for sure. You know you're autistic. You've known since you were six and that's not something we've ever believed in hiding from you because autism is nothing to be ashamed of. Neither is being different. Everyone in the world is different in some way from the next. Not many seem to actually realize this. People search for these things in one another called commonalities; those are what bonds us, makes us feel like, even though we're individuals, we're also united by a common thread. What bonds you to so many other people is autism, age, hair color, nationality, love of Thomas the Tank Engine, and your love of bacon. There are a lot of people in the world, considered different, who are also autistic. These are your tribes people, so to speak, and each of them are different from you in your unified differentness. Isn't that cool? You already know some of them and even had a play date with one of them this weekend. We're fully encouraging you to seek out your autistic peers because we think that you need to be around your people. We're not pushing you to "pass" as anything but Morgan, so you can have relief in that. We want you to be you, even if you're "different." I know that I'm not clearing up anything for you and that's because I can't answer your question. I could tell you that you were born autistic. I could tell you that God made you with more than extra dash of special. I could tell you all of these things that I wholeheartedly believe. However, I don't think that would satisfy any anxiety you might have. 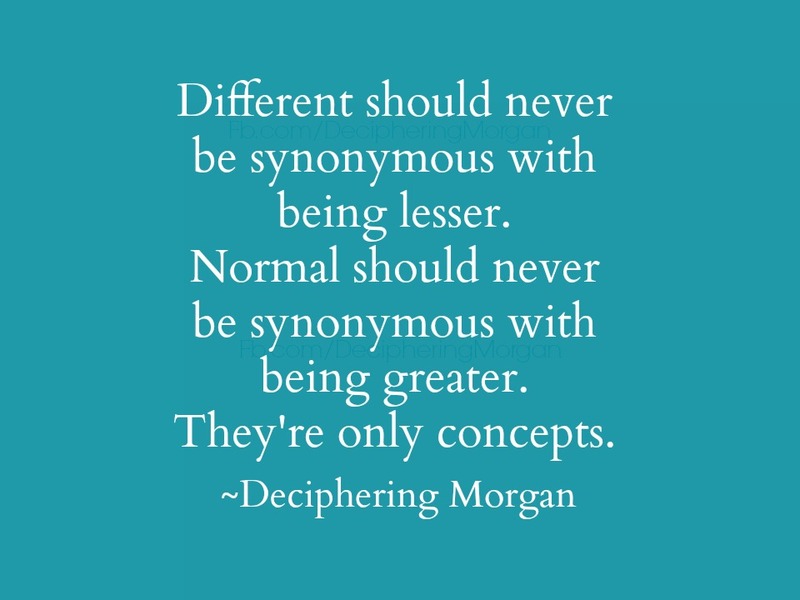 Just know this: don't ever allow anyone to convince you that being different is synonymous with being lesser just as normal should never be synonymous with being greater. Each are only man made concepts. That is all. Honey, we have more different than normal in this family, okay? I just fall in love with you and your boys. I really do. Finley, my daughter, would totally love hanging out your kiddos. Here via your Facebook page. I love htis letter. I'm sorry your Morgan felt anxious, but it's great you let him know that he's okay. Will you ever let him read this? Yes. It is my intention that he read this blog in its entirety one day when he's much older. I explained a lot of what's here to him. I'm 20 years old and have ASD, I am currently studying to be a software engineer, have a lovely girlfriend from another country, who I met online. We live together in our own appartment now :3 I wouldnt have been able to do any of this if it werent for my loving mom. I know it hasnt always been easy for her but hopefully I've been able to show her how much I appreciate her help! Good luck to everyone with autistic children here, you can take it from me that each and every one of them appreciates everything you do for them, even if they don't or can't show it to you themselves! Thank you for your kind comment, Wesley, and good luck in your endeavors.